Firstglass is an Independent Automotive glass replacement and repair company with over 20 years experience working with classic, prestige and modern cars and vans. We have also recently won the Swift Award for customer service. Firstglass is fully GQA/Sika registered 3731, to ensure quality and safety. Our purpose at Firstglass is to repair or replace glass to a high standard, that far exceed factory standards, using correct procedures every time, meeting our customer's expectations. Firstglass are professional, skilled and knowledgeable in all aspects of our work. Customers trust our knowledge, advice and professional approach in dealing with special requirements on all vehicles. A windscreen fitted by Firstglass is a safely fitted windscreen. With modern glazing techniques, the skill of glazing classic and prestige vehicles is diminishing. However, Firstglass have the expertise and can glaze your classic car using original glass, which in most cases is still available through our dedicated glass supplier network. 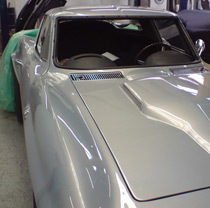 You may require glass specially cut and shaped to your classic car, this can be provided with flat laminated or toughened glass made to the original pattern and your requirements, all to the correct standard and legislation. Prestige vehicles normally require more time to replace a glass than massed produced vehicles. Firstglass adopts this when working on your vehicle and this reflects in the quality of our work, therefore we are recommended by Dorset and Hampshire’s leading prestige dealerships. Firstglass always works to the same highest standard and quality on all vehicles. Whatever your needs Firstglass can help. Our Van window conversions far exceed factory standards.